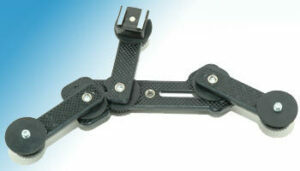 The “Strobe Dolly” double bracket attaches 2 strobes and a Pocket Wizard remote to your lightstand adapter. 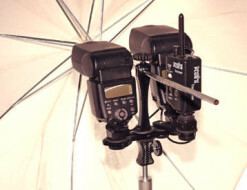 Makes setting up your hot shoe strobes with your Pocket Wizards ( or other remotes ) fast and easy. 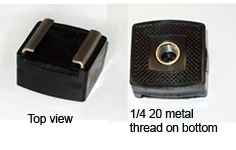 There are many configurations to choose from. 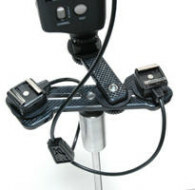 The Strobe Dolly makes your job easier, with the professional look you require. 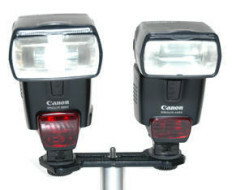 These setups will give you a one stop increase in light when using two flashes (at maximum power on manual), by setting both flashes at half the required power, recycle time is cut in half from what it would be when using only one flash. 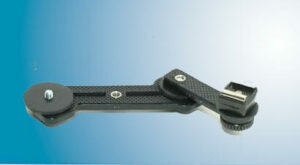 This Pocket wizard can be hung with the lanyard, or choose one ot the brackets with out Transmitter ( T mount ). 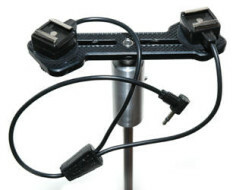 The transmitter mount and all the parts can be ordered separately at a later date. 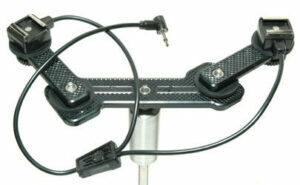 Cat# DSD-3T “Double Strobe Dolly” “T mount” and 3 “Xtend Arms.